To her great amusement during a recent telephone conversation, I explained to my friend Stense how, having finally managed to start appreciating certain poetry in recent years, I had just bought a collection by a poet whose earlier work I had very much enjoyed, only to find it utterly incomprehensible. 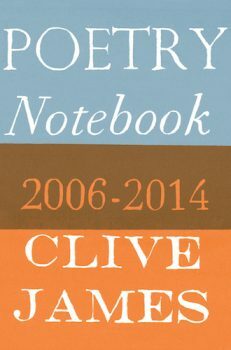 The following day, Stense spotted Clive James’s Poetry Notebook in a bookshop and bought it for me for Christmas. What this book made me realise is it’s OK not to enjoy certain poems—even, perhaps, the vast majority of them. And it’s OK to like certain bits of a poem, without necessarily liking the whole thing. James has a useful word to describe particularly good bits in poems: he refers to them as moments. Enjoying poetry is all about discovering such moments. James is firmly of the opinion that poetry needs to be formally constrained in some way for it to work. It needs metre, or a rhyme-scheme, or something like that—although it’s OK to break these self-imposed constraints from time to time for effect. James is clearly no fan of unconstrained, free-form poetry. I know where he’s coming from. It always felt like a total cheat to me. Poetry Notebook made me realise it was OK to feel that way. I should confess, I found a couple of the essays in Poetry Notebook hard-going. Most of them were originally written for a poetry journal, so they rightly assume the reader has a better working knowledge of poetry that I do. But the vast majority of the essays were very readable, and made a lot of sense. Having read this book, I know I’ll go about reading poetry in a different way in future. In fact, I think I might start by giving the incomprehensible collection a second chance.